I've got a shoebox full of chunky electronics. Mainly, proper industrial multi-pin plugs and sockets as big as your hand, but I'm not averse to switchgear too. My thinking is this lot is easier to wire up than the modern, and not so modern, computer versions with terminals within millimetres of each other. Pokeing a wide soldering iron bit in between them isn't fun to my mind. No idea quite what these key switches will do, but I fancy building them into a control panel. I suspect they are of telecoms original, but I'm sure a reader will be able to fill me in. Each is sprung loaded and depending on the colour of the middle plastic bit, will either latch or spring back. Some latch in one direction and spring in the other. Modifying the middle coloured nylon spike should change this characteristic as latching in both directions will be more use for point control - my first thought for future use. While buying switches, I also picked this up for pennies. It's a neat push-button unit for point control, but I just like the name. 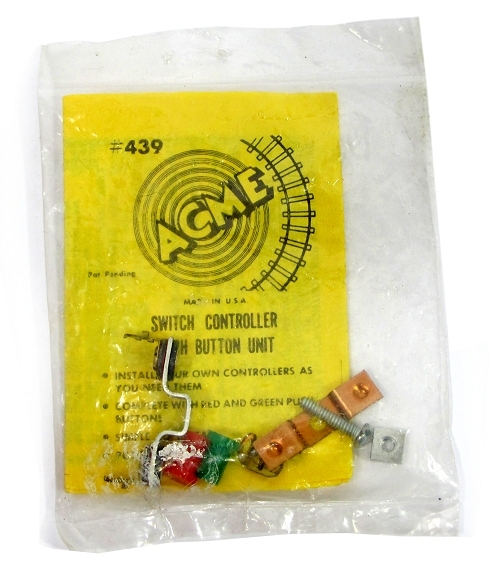 How many firms used "Acme" and which episode of the Roadrunner cartoon was this in? I suspect they may be ex-government surplus. I once had a panel in the 60's that was loaded with identical switches. It had been "liberated" from an Underwater Weapons Establishment. I have a switch with 2 DPDT switches on it. I use it to control 2 Tortoise swich machines at a double junction as it gives automatic interlocking: full up both straight, full down both curved, middle one straight one curved. 50 years ago Toronto had a stretch of the main street that was crowded with surplus shops. They've all disappeared now. These switches were used extensivly by by Post Office Telecomms, later BT, until the late 1980s. They had names line 'key switch 1110' (pronounced key switch eleven-ten), depending on their contact function. You can see equipment that used them here http://www.britishtelephones.com/pmbx2.htm and here http://www.britishtelephones.com/klu2a.htm . They effectivly replaced the old clunky (and rugged)toggle switches used on the chord type manual PMBXs. Those switches never failed. Although designed for fairly heavy daily uses the switches you show will fail mechanically and irreparably, so keep some spare!